You may have noticed that things are looking a little sparse at the Etsy shop. We're busy preparing for a house party in October so I won't be adding anything new to the shop until after that. We are working on new things, but they will be available first at the party, and then anything that's left will go on Etsy. However, I'm not planning to add any new girls clothes until the spring. I may change my mind in the slow winter months, but as of now I just don't see how it can happen. Our current designs will still be available, but nothing new. I apologize to all you faithful customers, but I never realized how much time it would take to do new designs for all the seasons! 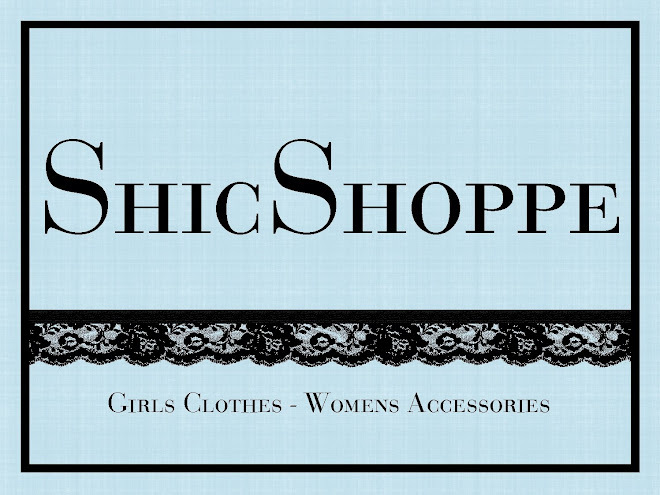 So maybe ShicShoppe will only have spring/summer clothes??? It's yet to be determined. Now more on the house party in October. My dear friend, Jessica, will be hosting a party at her house in Woods Cross, Utah on Friday, October 1st. We'll have lots of bracelets, necklaces, earrings, headbands, flower clips, bags and totes that you can buy and take away that evening. Oh, and did I mention there will be special "party pricing"!?! It's sure to be a fun night with snacks, door prizes, great products and even better company. So check back soon for enticing pictures and all the details on the location and time!